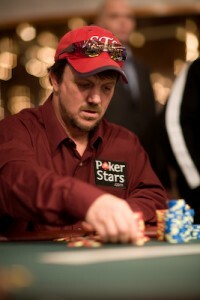 Tim Vance is a well-known poker player with an EPT title and $1.5mm in live tournament winnings under his belt. In years past, he made a living by winning online poker satellites at PokerStars that landed him in major competitions all over the world, including the WSOP Main Event. But the result of Black Friday in April 2011 put an abrupt stop to that. A resident of St. Louis, Missouri, Vance isn’t entertaining any aspirations that PokerStars will soon operate legally in his home state, but he is making every effort to support the acceptance of PokerStars in more affable states like New Jersey and California. David Baazov, CEO of PokerStars parent company Amaya Gaming, seems to be convinced that the online poker giant will be receiving a license to operate in New Jersey in the near future, perhaps as early as the fall of this year. As for California, online poker legislation has been on the table for 7 years, but infighting and lack of compromise between stakeholders has continuously thwarted the efforts of legislators to pass any regulatory measures. Just this week, two online poker bills were pulled when several influential tribes butted heads once again with the horse racing industry in regards to who should and should not be permitted to participate. But 53-year old Time Vance isn’t letting that deter his desire to “live the dream” once more. Nine years ago, Vance won a free FFP (frequent player point) satellite on PokerStars that landed him in the 2006 WSOP Main Event. Prior to Black Friday, he also won qualifiers to other major events around the world, including the EPT, PCA, LAPT and RPT. In 2008, Vance’s dream to win a major live poker tournament by qualifying online came true. He won the EPT Copenhagen Main Event in Denmark for a whopping $1,224,988. This year, since PokerStars no longer accepts US players or offers WSOP satellites to its players, Vance made the trip out to Las Vegas to play in a live satellite at the Rio. Low and behold, he won himself a seat in the 2015 WSOP Main Event. After finishing Day 1 with 52k chips to his name, Tim Vance took a moment to speak with reporters about his suspended love of online poker. Tim recanted the story of his success as it relates to his now-11 year old little girl. “I had been telling my daughter since she was old enough to understand me that I was going to go on TV one day and win a major poker tournament Thanks to PokerStars, I was able to do it,” he said. Correction: Yesterday, it was erroneously reported that Tim Vance had been eliminated from the 2015 WSOP Min Event on Day 2. That information was false. Vance is still in contention, currently riding into Day 2C with a median 80,300 chips.